Towards the upcoming election July the 3rd, the People’s Alliance for Democracy PAD and the Heaven and Earth Party have joined forces in a campaign to promote casting blank votes. 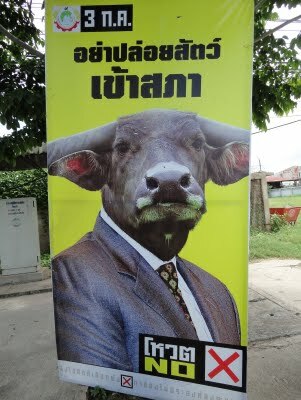 Both parties are against the politics of both current pm Abhisit and former pm Thaksin. 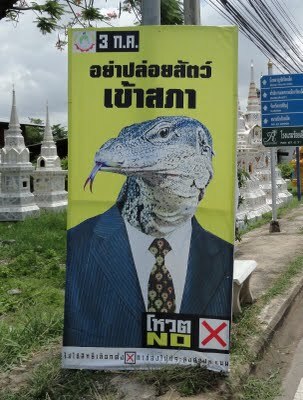 A previous campaign in begin of June, where animal heads were used as well, was ruled to be illegal. The official reason was that the billboards were too large and were displayed in an unproportionally high quantity. 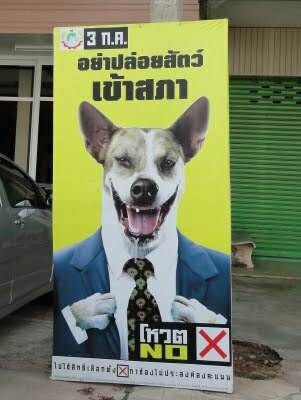 Alltough all other parties seem to be represented in Roi Et city, billboards of Abhisit’s Democratic Party are marked by absence. The bitter truth is; they wouldn’t last very long. I'm no master of Thai but I did take a stab at the translation as well. I assume this is a better translation than google's one: "Do not let the animals out"
I'm surprised that they got away with these signs. I don't know about the snake or tiger, but calling someone a buffalo, dog or monkey is extremely offensive. @Lawrence: I suppose they do not offend specific politicians, just current politicians in general. 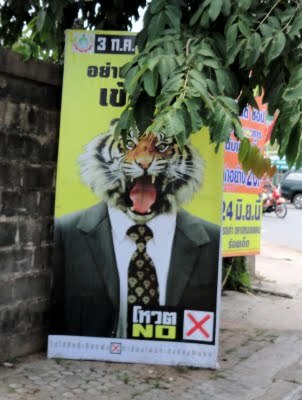 Hence it's not against Thai law, although I'm pretty sure they tried everything in their power to get rid of these billboards.